This outfit is the definition of the dream team mashup! All of my favorite classic and preppy brands are incorporated into this look: Kiel James Patrick, Lilly Pulitzer, vineyard vines, and Jack Rogers. As most of you know, I live in button downs. 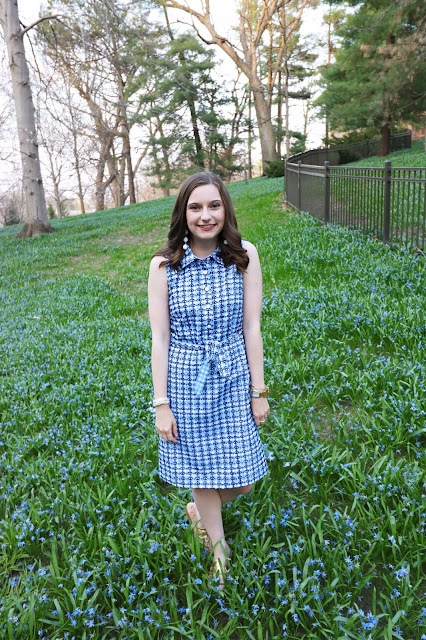 This is the perfect spring staple look for walking around for a day of shopping or for finishing up your school year (cheers for summer!). 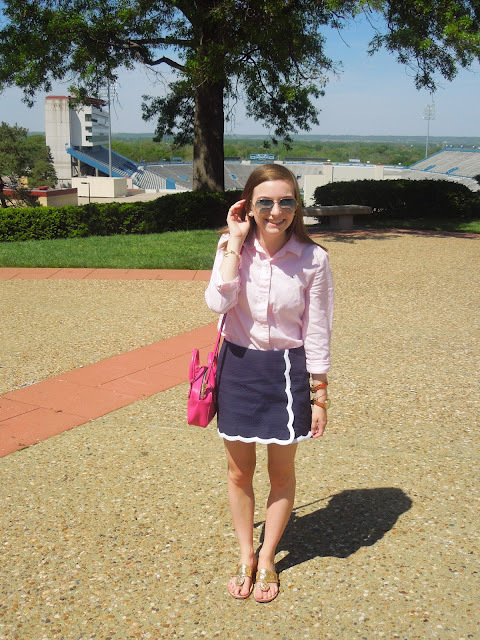 I've worn this navy Lilly Pulitzer skirt, but I was trying to find a new way to wear it. Pairing it with a plain white top has gotten boring. But, I've finally found a super cute new combo for it: colored button downs. 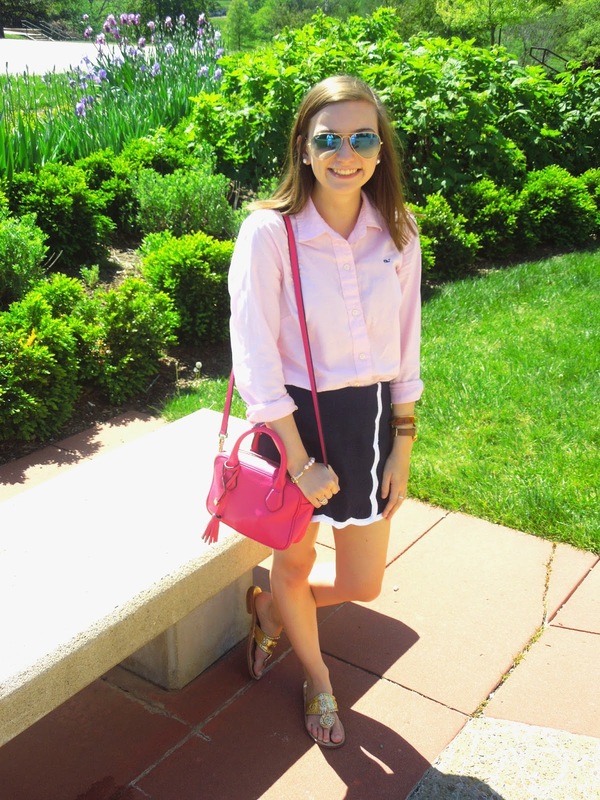 This light pink button down is the perfect mashup for this classic simple mini skirt. Not to mention navy and pink is a current favorite color combination. I wore this look for walking around Mass Street in Lawrence, KS before my boyfriends formal. We walked near their campanile and down by the football stadium. The weather was gorgeous so it was the perfect day to walk around. Although my allergies were killing me (literally) we still enjoyed the warm weather. 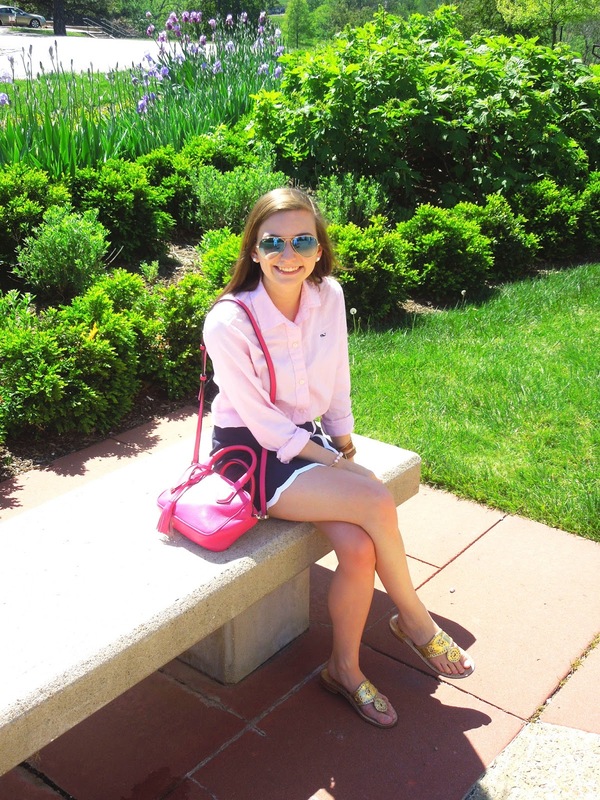 If you keep up with my posts, you will notice I wear this pink bag practically everyday. I LOVE IT. I picked it up in Italy and it is surprisingly versatile. Don't be afraid to pick up a bold handbag. Color is fun! I pair this bag with almost every look I wear. 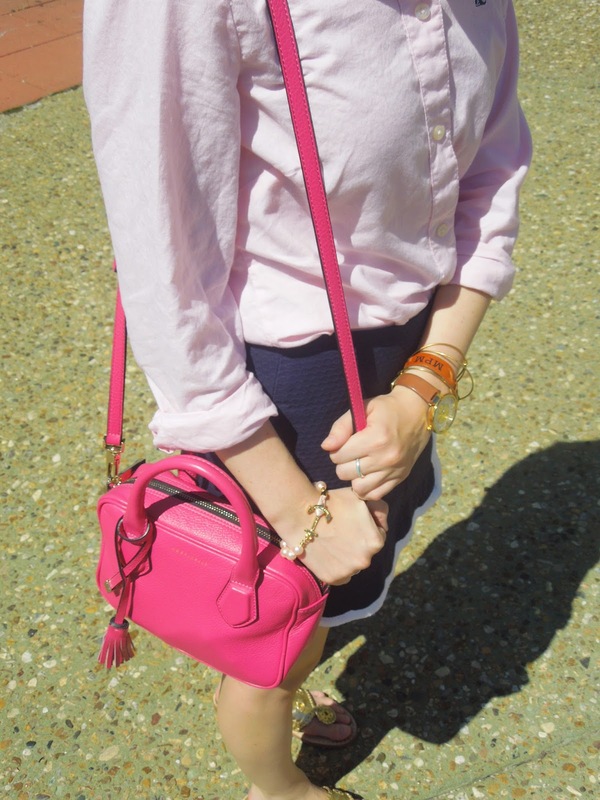 Find a color that you see in your wardrobe a lot and base your "fun" bag purchase off of that! Pink is a staple for me so this color works great with my closet. Another staple of mine are Jack Rogers sandals. My gold sandals are a must for summer and spring. I recently picked up a neutral brown pair that I can't wait to start wearing. Also, I scored a jelly pair from Nordstrom Rack for $24! Holy cow! Be sure to check out their website and on sites like Nordstrom for sales. They are a little expensive, for a flip flop sandal, but there are lots of deals out there. 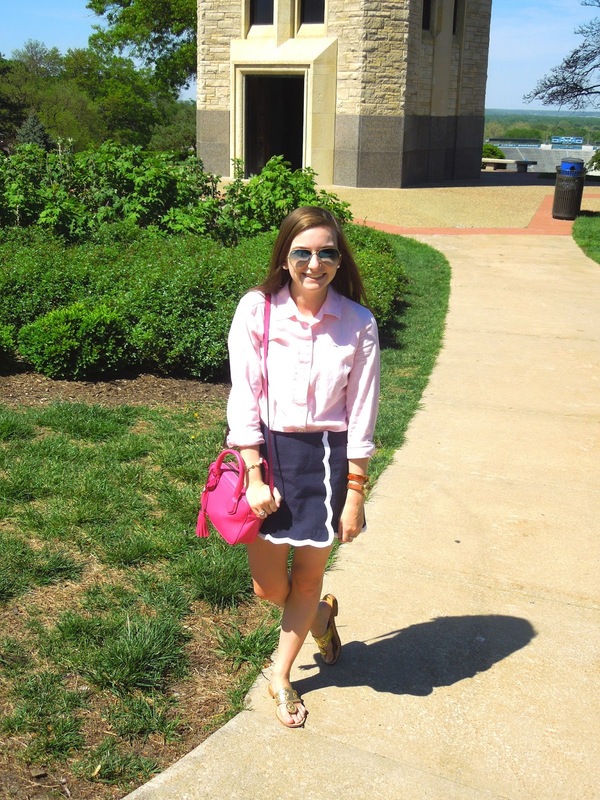 What are your favorite preppy brands? Let me know in the comments! LOVE your skirt gf! It's adorable! Thank you! It's a fun neutral piece :) thanks for reading!